It’s taken me years to develop a skin care routine that’s actually a routine. Meaning, I haven’t stuck with caring for my face with the same product or even similar products until this year. Now that I’m almost 25, I’ve managed to get a system going. Morning: If I wore makeup the night before, I’ll start by gently wiping any remaining bits off my eyes with eye makeup remover pads. I either use the Boots pads or a liquid on a cotton pad, such as Almay or Target brand liquid eye makeup remover. I’m not stuck on anything particular. Then I’ll wipe away the rest of my makeup with Vitamin E Oil on a cotton pad. I wash my face with the Lush Cosmetics Coalface bar. 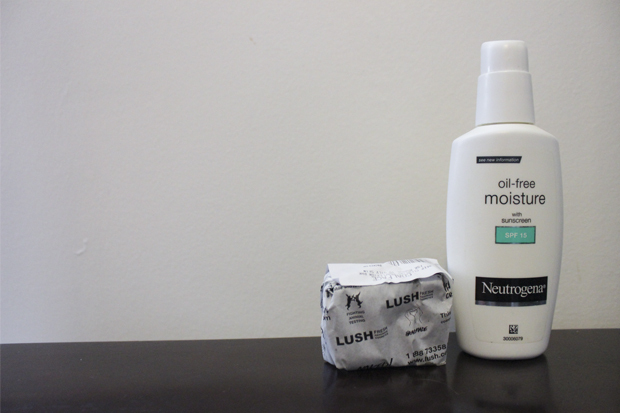 If my skin is feeling particularly dry, I’ll use the Neutrogena Fresh Foaming Cleanser instead. 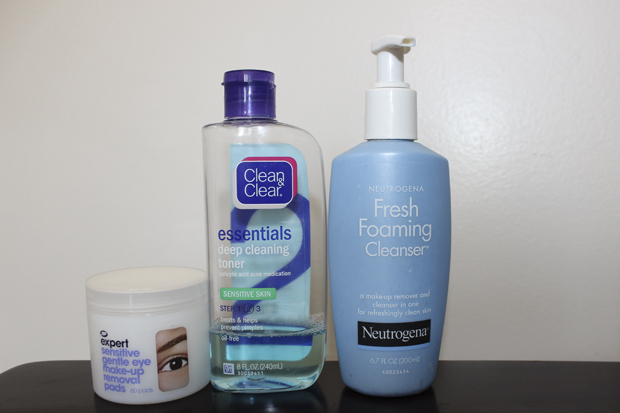 I’ve used the Neutrogena Cleanser off and on since I was 13. I still like it, but I like Coalface more. Then I’ll pat my face dry with a washcloth and put on some moisturizer. Night: I start off by washing my face, usually with my Lush bar soap. Then I’ll remove any traces of makeup, first around my eyes with remover and then on the rest of my face with vitamin E oil, same as in the morning. 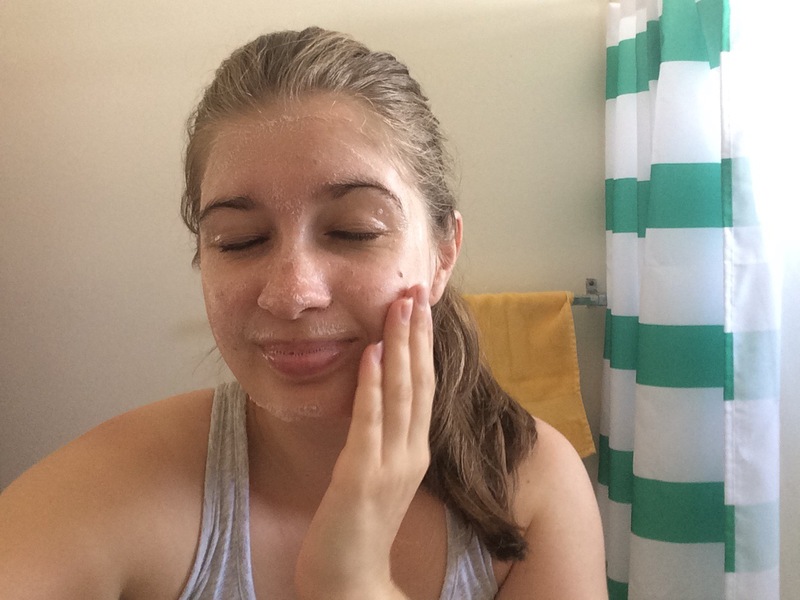 Next, I put the Clean & Clear Essentials toner on a cotton pad and wipe my face and neck, avoiding my eye area. I’ll top it off with the same moisturizer as in the morning. Extras: I use vitamin E oil, face masks and tea tree oil sparingly. I’ve had this particular bottle of vitamin e oil for more than a year now. I just forget to use it. 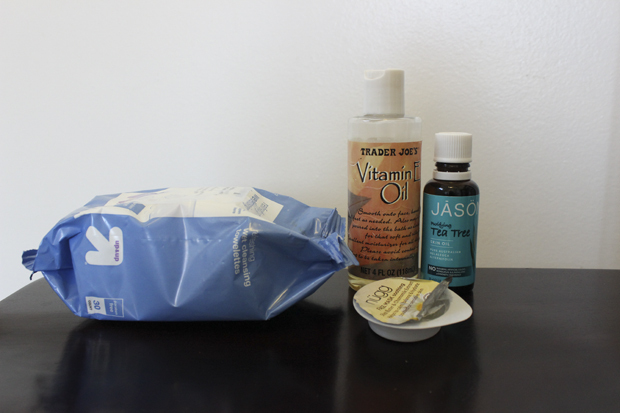 I’ve used the nügg Soothing Face Mask three or four times now and love it. It’s the only mask I’ve used more than once. It makes my skin feel perfectly smooth and clean. I’m not sold on the Jason Purifying Tea Tree Skin Oil yet. So far I’ve used it as an acne spot treatment and it’s not that effective. I’m hoping it can replace my Clean & Clear Essentials Deep Cleaning Toner For Sensitive Skin. I don’t want to give up the toner, but I am looking into natural products that are also cruelty free. I want to be good to my skin and the environment. I also always have face wipes handy for when I’m too lazy to wash my face. I find I don’t rely on them as much as I have in the past because I like my current bar soap. Besides making sure I wash my face every morning and put on moisturizer every morning as my mom taught me, I also make a conscious effort to drink plenty of water and eat healthy. Also, as weird as it may sound, I make it a point to brush my teeth before washing my face. That way I wash away any toothpaste slobber. Gross, but it helps. If you’ve read through to this point, congrats! That’s a lot of reading about some girl’s skin. So, what’s your regimen? Share in the comments! Yes I use vitamin e oil too!! Recently I’ve switched to tea tree oil and it’s been the best “product” I’ve used on my skin in forever. It’s helping to clear up acne and fade hyperpigmentation!! Wow! I’m glad to hear that it works. It feels good to use natural products.